I love, love, love cheesecake! So when I can find an excuse to have one, I'm a happy girl! 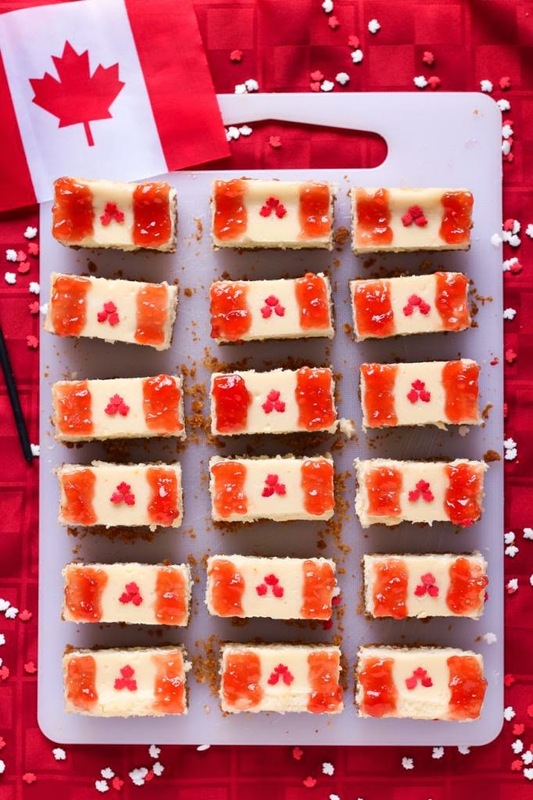 When I found these great Canada flag cheesecake bars here, I thought they would make the perfect dessert for Canada Day! 2. Line an 8-inch square baking pan with aluminum foil, leaving a few inches of foil draping over the sides of the pan (which will help with removal later). 3. Make the crust: Whisk the graham cracker crumbs, brown sugar, flour, and salt. Pour the melted butter over the mixture, and stir together with a fork until all crumbs are moistened. Transfer the mixture into the prepared pan and press evenly to form the crust. Bake in preheated oven for 12-15 minutes, until crust is beginning to brown. Transfer to a cooling rack to cool for about 30 minutes. 4. Meanwhile, prepare cheesecake filling. In a large bowl or bowl of an electric mixer, beat the cream cheese until smooth, about 3 minutes. Beat in the sugar until well combined, about 1 minute. Beat in eggs one at a time, fully incorporating each egg into the mixture. Beat in sour cream and vanilla until fully combined, about 30 seconds. 5. Pour mixture over cooled crust and return to oven. Bake for 35-40 minutes, until edges are set but the middle jiggles slightly (as a whole) when you shake the pan. Transfer to a cooling rack and let cool to room temperature, about 2 hours. Transfer to a refrigerator (I don’t cover mine because I find the cheesecake ‘sweats’) to cool completely, for at least 3 hours or preferably overnight.